Considered a great first snake, the ball python has a peaceful nature and has relative ease of care. They are typically dark brown or black with tan or golden ball shaped patches over their bodies. These snakes grow three to four feet, but hardly get longer than five, and have a lifespan of 20 to 30 years. A ball python can be kept in commercially made terrariums, best size is 36x18x12” (90x46x30cm), but a medium to large sized tote or a melamine rack would also work. Glass aquariums are an option as well, but be aware that ball pythons require a higher level of humidity (50 to 60 percent) than a screen top will be able to accommodate. Humidity is key to your Python being able to shed, so make sure that whatever tank you choose can provide appropriate humidity levels. Perhaps more important than the material of the cage is the hide box. All reptiles have a primitive fear of predators, and no number of years in captivity will breed that out of them. Thus, your ball python will require at least one place to “hide” within its tank. You can opt for a natural looking hiding place or a simple box. Flower pots or other clay pots make a great option. It is a good idea to have a hiding spot at each end of the cage – that way they don’t have to alternate between their heat source and their retreat. Speaking of heat sources, ball pythons will need a hot spot and a cold spot. Having one on each end of the cage is a good idea. Their warm, basking spot should be between 88-96F (31-36°C), but overall tank temperature cannot be less than 75F (23°C). Make sure you monitor the temperature, either with a digital probe or some other type of thermometer. ball pythons are cold-blooded; therefore they rely on external heat to regulate their body temperature. Thus, it is imperative that you keep the tank at a consistent temperature. You can use a heater under the tank to provide the required heat, or you can use a basking bulb or heat emitter. Hot rocks do not provide even enough heat, and thus run the risk of burning your python. You should thoroughly clean the tank each month, removing all bedding and waste materials. The bedding can be newspapers and paper towels – the easiest and cheapest option – but you can also use cypress and orchid bark (just not cedar). Barks can help create humidity, but make sure it doesn’t create too much moisture, as that can be more detrimental than too little. When you change the substrate each month, disinfect the tank with a low concentration (five percent) of bleach solution. In between full cleanings, just remove waste material to keep the tank clean. Female ball pythons will lay eggs in a pyramid form. She will wrap herself around the eggs to protect them and will cover them with her body once she has finished laying. Eggs can be incubated by the mother or in an incubator, but keep the temperature controlled in the tank (the mid-80s(~30°C)), especially if the mother is incubating, as she is only able to raise the temperature of the eggs, not lower it if they get too hot. Monitor humidity as well, especially if the eggs start to collapse, as breakdown indicates a need for greater moisture. 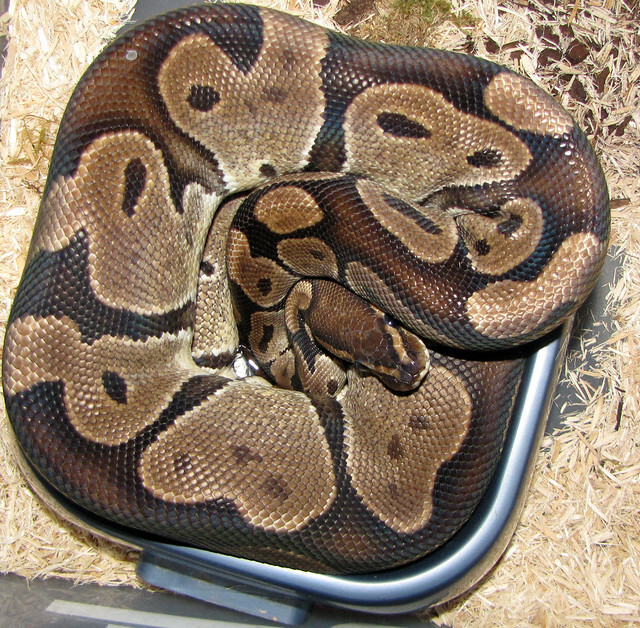 Juvenile ball pythons seem to prefer smaller enclosures, as large cages tend to overwhelm them. 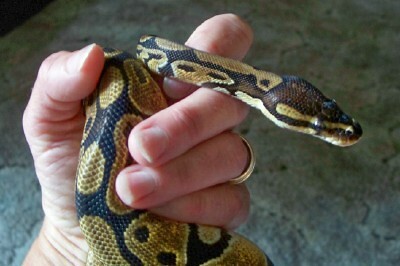 You can feed young pythons rats right away, just start with rat pups or crawlers. Make sure that their water dish is no more than an inch deep either, as they may try to crawl into the bowl. Your Python has a 12/12 cycle, so it will be awake for 12 hours and then asleep for 12 hours. As a nocturnal species, it will probably have its 12 sleeping hours as sleeping. Pythons are shy animals, and will probably hide much of the time. It will take time to build trust with your python, but, with gentle, careful contact, it may decide it likes being handled. Remember that pythons may bite if they feel too afraid of you, so do not try to touch it if it looks like it’s about to strike. ball pythons are not venomous. Handling and excitement influence your Python’s eating habits, so make sure you don’t handle before feeding (it won’t eat if you do) and keep the cage away from noisy areas or areas with a lot of activities. When a ball python is about to shed, its stomach will become pinker. After that, its skin will become significantly more opaque, and then the eyes will begin to appear bluish or milky (shown in the picture below). The eyes should go back to normal within 36 hours, at which point, the snake will begin to shed. sure your snake sheds properly. It is important to check the eyes and the tail, in particular, to ensure no skin hasn’t shed. Pythons eat “appropriately sized” rodents, which means you shouldn’t feed your python a rodent that’s any bigger than the python is in circumference at their largest point. Adults can eat adult mice and small rats. You should feed them once a week and transition to once every other week as they get older and are no longer growing. Do not let live rodents into the cage without supervision as they can harm your python. Using thawed rodents are better options. Be careful not to handle your ball python after feeding. They may regurgitate their food with too much handling. However, it can be helpful to feed the snake in another cage and then move them back to its regular cage. They will learn to associate being handled by you with getting to eat and will become accustomed to being handled more (or at least choose to stop mistaking your hand for food when you reach into the cage). Pythons tend to go extended periods of time during the winter without eating, so you probably do not need to be concerned if your python stops eating, but shows no other sign of illness. Continue attempting to feed your python every few days for two weeks, and eventually, it should start wanting food again. Monitor your Python’s weight during this fasting period. If it loses more than ten percent of its body weight, you should take it to a vet. Note: Your python may stop eating during shedding periods. Obviously, having clean water available for your ball python is important, but the size of the dish can vary. Just know that if the bowl is large enough for the python to get all the way into, they will decide to do that sooner or later. Clean and disinfect the bowl at least once a week, as pythons are not very good about keeping the bowl clean themselves. If you opt not to allow your python a soaking area in the water bowl, you need to have one of their access holes either lined with damp moss or moist paper towels. 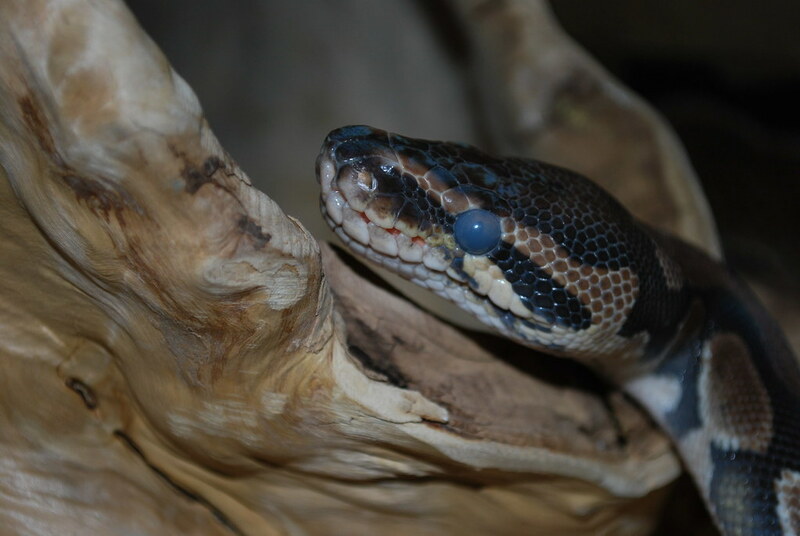 If your ball python enters a fasting period and is approaching a loss of ten percent of its body weight, you can start trying to get it to eat by dipping the rodents in a broth before offering it to the python. You might also try adjusting feeding time to night or while the cage is covered in a tile, or exposing the rodent’s brain before feeding it to the python. Some suggest trying to bribe the snake into eating by offering it other food rather than a mouse but be aware that this may cause your snake to start preferring this diet to mice, and it may become less likely to eat mice in the future. Other health concerns to watch out for are respiratory infections, parasites, injuries or trauma from live prey, burns, mouth rot, or retained shedding. A regular check up by an exotic veterinarian is suggested every 6 to 12 months, and feces is tested for parasites at that time, especially if you feed live prey to your ball python.